This facial mask recipe is perfect for all skin types, yet has never been better when used after a long hot summer when our skin has been exposed to the heat and sun. Summer time tends to dry out our skin, leaving it feeling chapped, sunburned, peeling and even itchy, especially if we perspired a lot which prompts us to over cleanse our face sometimes. This natural Avocado facial mask recipe will work wonders on mature skin quite well, making skin feel soothed, soft and moist. 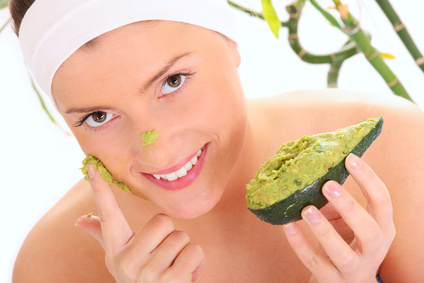 Plus it is a great way to use up over ripened avocados and becomes excellent skin food for nourishing tired skin. The Facial Mask Ingredients You'll Need! If you get your avocado really squishy, a fork is all that you'll need, otherwise a food processor or blender will be necessary. Now mash it until it is smooth and creamy. The amazing benefits of natural Avocado oil are wonderful. It is an extremely deep penetrating oil rich in A, D and E and potassium. It is high in Sterolins, soothing skin irritations and itching associated with it, similar to a cortisone cream. The avocado in the mask infuses intensive moisture into the skin, yet is perfect for every skin type, especially for softening mature skin. Now stir in your honey until smooth again. Honey is a natural humectant and antibacterial ingredient, and works wonders on toning the appearance of skin. Add the yogurt next and stir it all together. Yogurt is perfect as the cleansing agent in your mask and due to the lactic acid it possesses, it works great as gentle exfoliant and for soothing and softening skin while it refines the pores and tones. Once it is all mixed, pop it in the microwave for a few seconds (about 5-10) just to take the chill off. Now add a drop or two of your essential oil (optional), or squeeze a slice of lemon into the mask, approximately a teaspoon which also acts as a natural exfoliant. Prepare your skin with warm water only, and do not use cleanser prior to the mask since this would be a bit much for the skin. Don't worry, the avocado mask will work fine for getting skin clean. However, if you are wearing your mineral makeup, then this would not work best. So you'll want to probably do this on your day off or in the morning before work would be the best time. Gently pat all over the face and neck and relax for a bit, about 15 minutes or more. Or create a spa like experience by soaking in a warm bath delicately scented with bath salts or your favorite essential oil blend you may have used in your mask for awakening the senses. Now rinse and apply facial toner and your favorite skin cream from our ONATI Skin Care collection, or simply let your face go "au naturale" for the day. You'll be amazed at the softness and soothing comfort this mask brings to dry, chafed, sunburned or itchy skin. 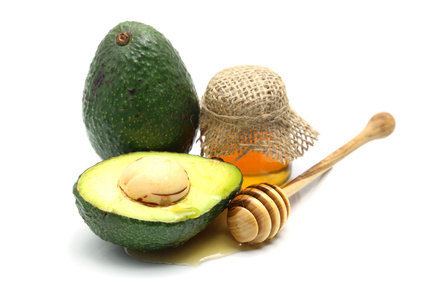 BEAUTY TIP: food grade masks can be stored for a day or so if you like, but note, avocado is just like a banana, it will turn black with exposure to air, whereby also losing out on the vital nutrients the avocado provides to skin health. So you can do one of two things if you should have any leftovers; use the avocado mask as a hair and scalp treatment which leaves your scalp feeling soothed and your hair soft and shiny, or go ahead and eat it as long as it is all food grade. Better yet, chop some onion in and have a bit of dip for your taco chip, or add some chicken and spread on whole wheat toast for a terrific snack.